Workshops and seminars are presented in dynamic, interactive, two-day, one-day, and half-day formats. Workshops include participant prework and assessments. For detailed program descriptions, click below. 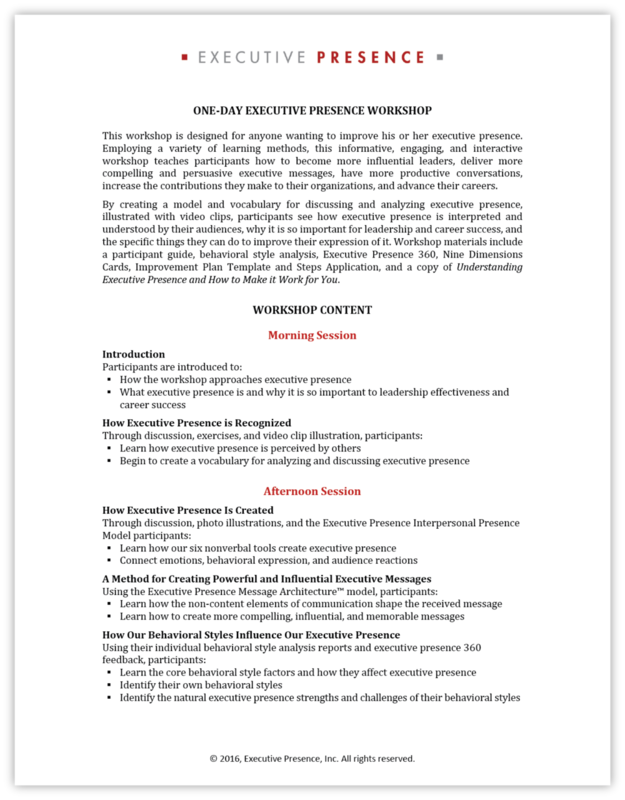 What makes Executive Presence workshops so effective is the unique combination of research based content and six powerful components. Clear Definition of Executive Presence: Executive Presence Inc. focuses directly on how executive presence is recognized and the specific behaviors that create it. By clearly specifying those behaviors and creating a vocabulary for analyzing them, participants can immediately start to improve. 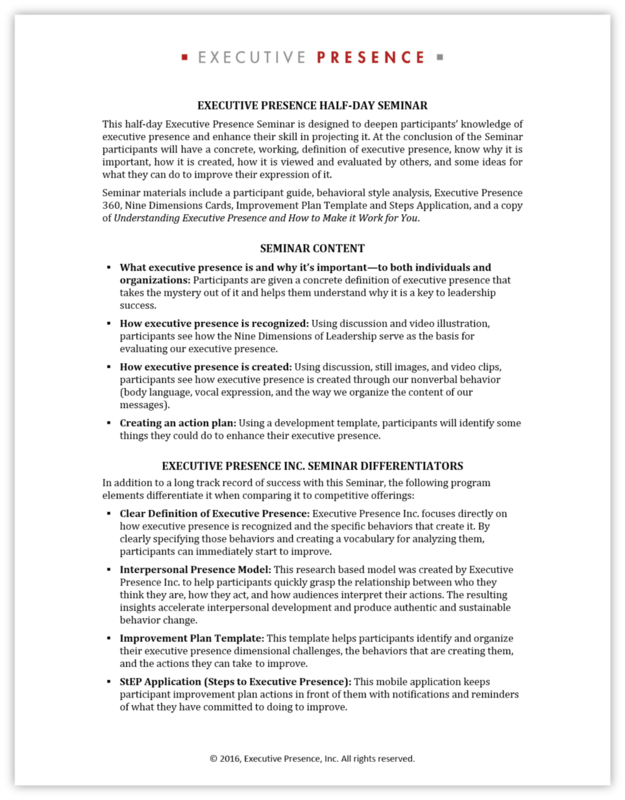 Executive Presence 360: This focused evaluation was created by Executive Presence Inc. to provide feedback from peers, subordinates, and superiors on how well participants project the expressive dimensions that are keys to executive presence. The patterns in this feedback provide important insights into strengths and challenges that must be taken into account when participants create their on-going executive presence development plans. Video Analysis: (Two-Day only) Participants are videotaped so they can see themselves as others see them. They also get feedback from others about these videotaped interactions. This enables them to compare the way they interact with models of interaction presented in a series of instructive video clips. The result is enhanced interpersonal insight and accelerated, on-going growth. Interpersonal Presence Model: This research-based model was created by Executive Presence Inc. to help participants quickly grasp the relationship between which they think they are, how they act, and how audiences interpret their actions. The resulting insights accelerate interpersonal development and produce authentic and sustainable behavior change. Message Architecture™: This proprietary method for developing executive messages has received rave reviews from hundreds of workshop participants and coaching clients. Its power comes from the simple and direct way it shapes and clarifies communications, dramatically improving their focus, clarity, and persuasive appeal.